SANDY LEVEL, Va. — It might seem odd, but fish just love trees. They also love cinder blocks, pipe and a host of other weird-looking things, when they’re put underwater, of course. They hide in these complexes, and they hunt for food in them. An effort by Appalachian Power will help fishermen and property owners at Smith Mountain Lake learn just what type of stuff fish love best. 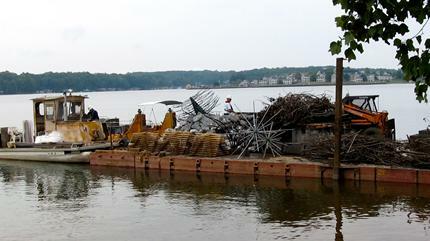 A barge prepares to drop fish structures at different places in Smith Mountain Lake. The structures will be evaluated in the spring to determine which work best at attracting fish. Photo courtesy of Ken Stump. As part of the company’s federal license to operate the Smith Mountain Pumped Storage Facility, the company undertakes initiatives that improve the recreational and environmental qualities of the lake. Part of that process includes installing fish habitat, and the company will be doing plenty of that around piers and boat ramps throughout the rest of this year. But, Appalachian Power’s role in putting in habitat can be complemented if property owners do the same, and do it correctly. With participation from a Habitat Review Technical Review Committee that includes local and state agencies, as well as the BASS association, 12 different types of habitat were identified for the study. The types of habitat range from natural brush, to pyramid-shaped objects, recycled wooden pallets, and even some structures that are sold in sporting goods stores. In the spring, divers from the Virginia Department of Game and Inland Fisheries will evaluate the structures and be able to recommend what type performs best, according to Elizabeth Parcell, in Appalachian’s Hydro Operations Department.